A special mention goes to the Company’s core business, manufacturing and marketing of best-in-class weaving machines, which registered unprecedented sales results over the same period of 2017. An exceptional leap for Itema weaving machines which increasingly represent the preferred choice and continue to gather the appreciation of weavers in the main textile markets such as China, Turkey and India. The turnover shows the Group’s strong international presence with the 92% of the total resulting from foreign markets. The Italian market achieved good results as well, with the positive trend registered in weaving machines sales demonstrating the good market performances of the “Made in Italy” premium quality fabrics producers. But weaving machines were not alone in providing satisfaction for Itema. In 2017 the Group launched a diversification strategy – “Project Galaxy” - that led as its first successful operation to the acquisition of a majority interest (61%) in Lamiflex, leading supplier of technical composite products for the textile, aeronautical and medical industries whose turnover increased by 6% YOY in the first quarter of 2018. Itema, although conscious to operate in a highly volatile market subject to sudden slowdowns due to the fragile macroeconomic and political conditions of certain textile markets, will face the rest of the year relying on the momentum and confidence ensured by a well-filled order book for the upcoming months. As a real proof of the Itema focus on innovation, the Company recently launched on the market (during ITM 2018 exhibition held in Istanbul in April) the new R95002denim rapier weaving machine, the Second Generation of the weaving machine specifically designed and developed to excel in denim weaving which features numerous advancements and a breakthrough innovation. With iSAVER™, developed by the advanced innovation department ItemaLab™, Itema pushes the boundaries of innovation in the weaving industry. 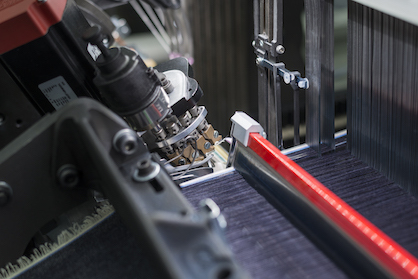 For the first time since the launch of the industrial weaving machine Itema introduced a breakthrough innovation able to completely eliminate the waste selvedge on the fabric left side and leading to substantial, real and measurable savings for denim weavers. Economic saving is not the unique outstanding benefit, since iSAVER™ sets a new benchmark in sustainable weaving, significantly reducing raw materials waste. The Group confirms its firm determination in strengthening its leadership and growing not only organically but also through targeted acquisitions (“Project Galaxy”) thus creating significant synergies along the respective supply chains to grow not only in the textile machinery sector, but also to expand into new, highly innovative industries. In this scenario finds its place the acquisition of majority stakes in Lamiflex, the first in a series of important operations meant to ultimately accelerate the continued expansion and secure the long-term profitability of Itema by diversifying into complementary, high-growth markets through stakes in innovation-driven companies. “With this precise objective in mind Itema also recently considered a listing on the stock market, with an IPO which passed all the tests for obtaining the admission to the Italian Stock Exchange but did not arrive at completion solely due to the - sudden - changes in the equity market conditions that held back investor momentum. Our decision is an objective assessment of what we see as best for Itema in this specific moment, particularly taking into account that our positive net financial position and our excellent market results enable us to continue autonomously along our growth path”, Mr. Rogora added. “With our shareholders’ full-fledged support we will therefore proceed in building an even more solid and competitive Group at a global level and in concentrating our extensive R&D efforts on offering better, smarter, faster solutions, increased performances, reduced consumption and enhanced user-friendliness,” Rogora concluded. More News from ITEMA S.p.A.